I rode a horse I’ve never ridden before today, named Rosie. 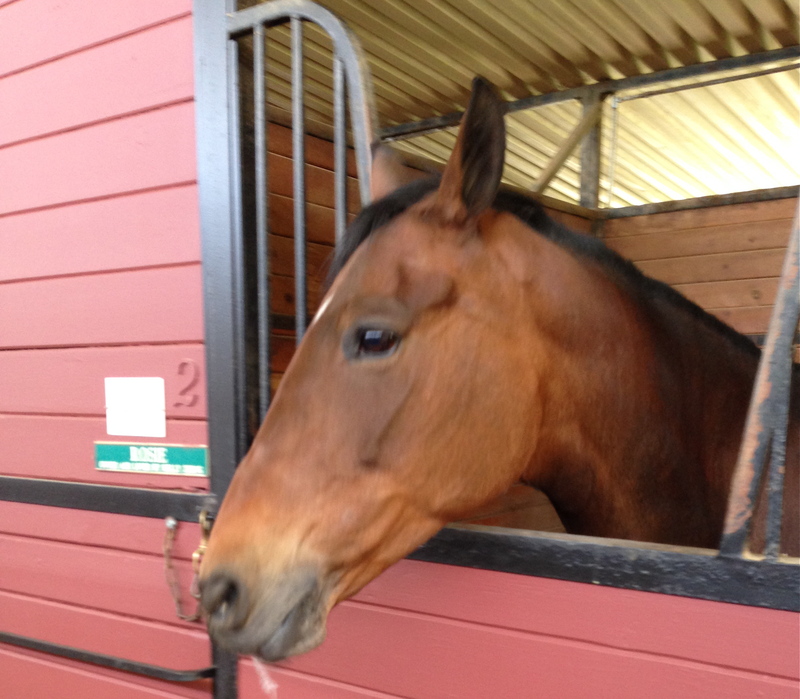 She’s a real beauty; a small, bay mare with a sweet face. I got to the barn with plenty of time to warm up today, and it was a good thing. When I got on Rosie, she was pretty lazy. I haven’t really experienced a horse just kind of refusing to move in a long while. Even my big, lumbering pal Jasper back in Brooklyn would get a move on if you gave him a good squeeze and flapped his reins at him. At first this got me all in a huff. It is pretty warm today, and I found myself getting worked up about her not even wanting to trot, sweating and breathing kinda hard from the effort. But then I slowed myself down and reminded myself that I do actually know how to handle this behavior. I gave her a couple of “I mean business” kicks to get her going, and then a light tap with the crop whenever she started trying to slow down. It’s amazing how easy it is to forget the basics sometimes. When I look back, it feels like the first several years I rode were just all about trying to get the horse going and preventing him from stopping. This was back when I was small enough that I probably felt like a fly on the horse’s back and the nickname my trainer gave me was “Noodle Legs” (after a while, she informed me that they had become more al dente). I used to ride this crazy Appaloosa back then named Alvin who would really put me through the ringer. He’d basically mosey into the corner of the ring and stand there, adamantly refusing to move an inch. He’d stolidly withstand my squeezes and kicks and clucks until I was so frustrated I’d be ready to give up. And then my trainer would tell me, “You’re in charge. Make him.” I never really did anything different physically after that; it felt like the same squeezes and kicks and clucks, but they came from a different place, internally. The place where I wasn’t a tiny child asking a big animal to please be nice and do what I wanted him to do, but the place where I was a rider and I was telling my horse it was time to go. And the thing with Alvin was, once you showed him you had that mentality, he’d do anything for you. With Rosie, it was much the same. She wanted to fool around at first but once I told her what’s what, she picked up her pace. She’s quite a nice mover. Her canter is a little longer and lopier than the ponies I’ve been riding lately but even at faster speeds, it never feels strung out. It’s a smooth, graceful movement with all of her muscles in concert. Maybe part of the perception of her canter being longer is just that she’s actually a horse. With the exception of one ride on Flash and one on Sjapoo, I’ve only ridden ponies at this barn. Bella is in the upper realms of ponydom but I still always feel a tiny bit too big on her, or that I expect her to take bigger, horse-sized spots when it would make sense to wait and add. Rosie is a small horse, probably only 15.1 or 15.2 but that tiny bit more height seemingly makes such a big difference, especially when jumping. Jumping her was fun today, because she was quite willing to go for a bigger spot. My mind just felt so different today than it has, so much more stable and strong. At the beginning of the lesson, on a new horse that I didn’t know who was seemingly going to give me a tough time, I felt the old anxiety start to vibrate in my chest. But then I just took control and it went away. I felt more capable on the jumps than I have in weeks and weeks. Even in between them, I felt like I was stretched up taller with my heels further down; I felt so much less sloppy in my equitation. It was like I had all this extra space inside my head, and literally like time was moving slower, so I had time to do things like, you know, breathe and think.